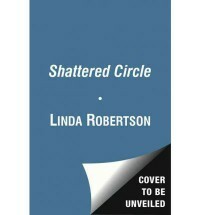 Shattered Circle is a refreshing installment of the Persephone Alcmedi series. It takes a little different approach than the previous books. There is still plenty going on with Menessos, his loosing his haven and having to take care of the three sisters and the havoc they wreck. Johnny is as unable to walk away from being Domn Lup as ever, threats coming from every direction at a time when he has even more to loose (can’t say what, would ruin the surprise if you haven’t picked up the series yet). And Seph finds herself separated from the men in her life, to fix things she is going to have to sacrifice herself and make a deal with the devil. The majority of this book takes place with our three; Seph, Menessos, and Johnny apart. It reads different than the previous books, but is no less entertaining and engrossing. You may have been wondering if things could go back to normal, particularly between Seph and Johnny. Well...that is just not going to happen. Too much is changing besides our characters themselves. They are growing, making choices that alter who they are. And don’t we love them for it? It keeps us wondering, oh does it keep us wondering.